Acne can be so distressing. Read how to use baking soda for acne or pimples. Is it effective? Well, testimonials and reviews from several users point to an effective remedy for this common problem affecting teens and young adults. Apart from the DIY steps, I will also expound on the common merits and demerits associated with their use for dark spots. 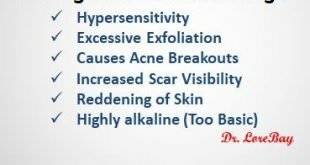 Can I use Baking Soda for Acne & Dark Spots? Human beings are naturally sensitive about their facial appearance. Any person having acne or dark spots on their face try as much as possible to remove them using the readily available remedy. However, not all remedies work and therefore, most people end up being frustrated and unhappy. The applicability of baking soda has been proven to be the most readily and locally available beauty remedy that treats numerous skin disorders. In case you are struggling with acne and dark spots on your face, try using the baking soda. Most of those who have used the baking soda can attest that the soda works in treating the dark and acne scars. Therefore, it is safe to use the baking soda in treating the stubborn dark spots and acne scars that are making you unhappy about your facial appearance. Preparing the baking soda paste; mixing water and the baking soda. However, as much as the baking soda is simple to apply and works miracles on your skin, it is important to take precautions. For instance, before using the baking soda, ensure that they are not expired as this might affect your appearance. Additionally, you should never apply the baking soda on a daily basis. Apply it maximumly three times a week. That is because the baking soda ca interfere with the integrity of your skin, more especially if you apply it daily. Once the skin integrity has been damaged, you will be vulnerable to pathogenic attacks. This may further worsen your skin or face appearances. Using the baking soda can be accomplished in three distinct ways: through the bath, scrub, and wash. Through bath, all you need to do is add a half a cup of baking soda into your bathing water before using it. Then soak yourself in the water for not less than 10 minutes to let your skin has absorbed the baking soda. When that is done, you can then continue with your bathing process. Please, when bathing ensure that you use a soft piece of cloth or towel, using hard and rough materials on your skin can damage your skin’s outer layer. Through scrub, you are required to first make a baking soda paste. The process is simple, mix water and the baking soda. Once you have the paste ready, apply it on your skin, leave it for not more than 30 minutes. Rinse it using a lukewarm water and do this twice a week to get an optimal outcome. Through wash, you add the baking soda on to your hands, add a little water and rub it on your face just like the way we do it in the morning when washing our face. However, unlike the other morning face washings, in this one, you are required to leave the baking soda on your face for five minutes before rinsing it. Individuals are usually allowed to decide which of the above procedure they would like to use. The correct application of the baking soda on your face facilitates the removal of acne. Therefore, ensure that you follow any of the above procedures when applying the soda. Using the baking soda can significantly change your facial appearance. Look at the following pictures, A and B, can you believe that it is one person? Most likely you cannot believe because the second picture, B, looks very different and beautiful. These differences are due to the usage of the baking soda. In picture A, the person does not use the baking soda, hence the reason for increased acne scars on the face, which have completely damaged her appearance. In picture B, the person uses baking soda and indeed you can tell the differences that exist between picture B and A. The individual after using the baking soda, the face appears smooth and beautiful with no acne scars as it was the case before she begun using the soda. Using the baking soda toothpaste for acne has been shown to work in treating acne. It is the quickest and most available remedy an individual can use when he or she wants to heal a face with acne. However, when applying the toothpaste, you are advised to ensure that you avoid applying it to sensitive parts of the face like the eyes. These regions have a delicate skin, which easily gets damaged and could take longer to heal if damaged, hence the reason for one to be careful when applying the paste. Baking soda is basically meant for beauty and face cleaning. Therefore, when you are using it, you expect to see significant changes within the first few weeks of usage. These changes must be positive in that they enhance your beauty and face cleaning. However, if you notice negative changes you should stop using the baking soda and consult a physician for further instructions. Some of the negative changes include an increase in the number of skin rashes, swellings on your face and having an outbreak of acne. Bio Oil for Acne Scars on Face Reviews: Good for Oily Skin?